Every Tuesday, Wednesday and Sunday from Tuesday 12th May until Sunday 18th October 2015 you will be able to explore Breadalbane on the hop-on hop-off Ring of Breadalbane Explorer bus service. 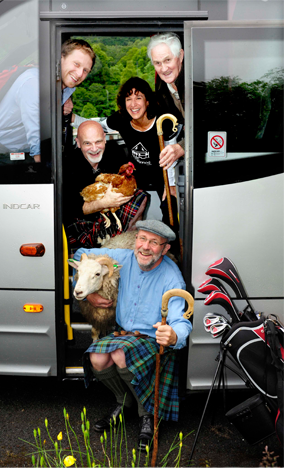 We supply the Ring of Breadalbane Explorer Bus. A new bus service linking the stunning scenery, beautiful villages and visitor attractions of the Breadalbane area in the Southern Scottish Highlands. The Ring of Breadalbane Explorer lets you experience the rich culture, heritage and landscape of highland Perthshire and Stirling, taking in some of Scotland's major attractions. Visit the Scottish Crannog Centre, the Famous Grouse Experience, Auchingarrich Wildlife Park, Highland Safaris, Dewar's World of Whisky and The Watermill, Aberfeldy, all the time passing through great mountain scenery. Explore the Ring of Breadalbane. Linking the attractions, footpaths, cycle routes, mountains, lochs and communities of Aberfeldy-Crieff-Comrie-St Fillans-Lochearnhead-Killin-Kenmore with a circular hop-on, hop-off service in both directions. From Tuesday 12th May until Sunday 18th October 2015 the hop on hop off day ticket is £10. Children half price, 5 and under free. Scottish bus passes and concessions are valid. Point to point journeys cost the same as standard bus fares. View a copy of the 2015 route timetable.